I have been busy patting myself on the back all weekend long because my playhouse this year turned out pretty amazing. I know, pretty bold statement to “admit” that the playhouse that I designed is better than good. Is it better than all the others playhouses I’ve designed? Hey … settle down, let’s not go crazy. I have written one of these posts every year around this time since I started this blog (back in 2010). In that span, I have designed so many playhouses I can’t remember them all, and through the ‘Life of an Architect Playhouse Design Competition’, I’ve had even more built. But in a moment of baring my innermost insecurities to the 17 people who read my blog, I am overly concerned every year that this will be the year that my playhouse design is terrible. I worry that they are boring, or predictable, or kids will hate them, that their parents will hate winning it and will keep their fingers crossed when the time comes for their child to drop that raffle ticket in the box next to a playhouse. I think I’ve dodged that bullet for another year. 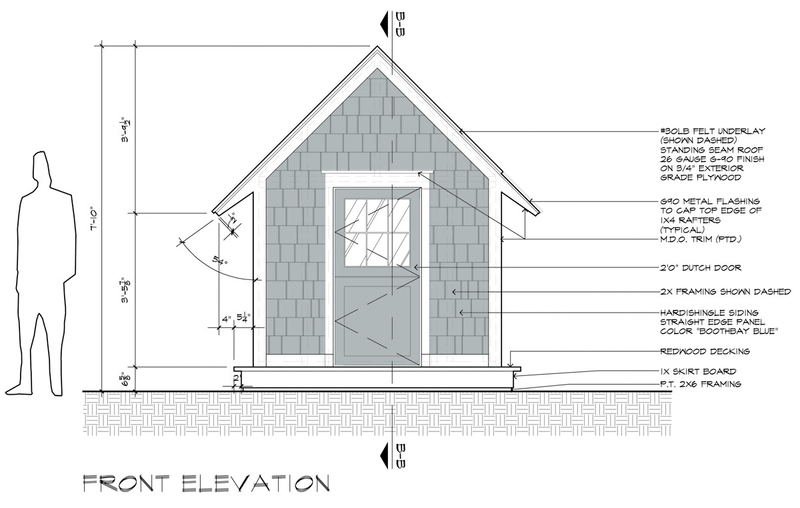 As I do every year, I publish the construction drawings for my playhouse for free so that anyone who is so inclined can take on this project and build this playhouse for whatever need or purpose they see fit. Build it for your kid, build it for your church, build it for a non-profit to auction off – whatever. I have always made the drawings available and, in addition, I typically show a step-by-step construction walkthrough guide for the playhouses I design. That’s what you get today – the construction walkthrough for “The Cottage House”. What?!? Can you believe that the first time I was able to make it out to the job site where this year’s playhouse was being built was day 2 … and this was how far they got. I should have known that they would fly through the first parts because 1) I have had the same homebuilder, BufordHawthorne Builders, building my playhouses for years, and 2) my designs pretty much always use the same deck and substructure every year. They know what they’re doing and they are extremely familiar with how I want it done. It was a really simple form this year – I was going with something that had a Seaside Cottage feel to it. The cladding would be important, and you know the scale is always important, but the only real zing in this year’s design would be how I peeled the roof back on one side to expose the rafters. That large opening is a screened wall (I have proof of life requirements for my playhouse – no hotboxes allowed) and would allow for plenty of air circulation and visibility. This is the back side view … pretty plain, but that’s okay with me. I need sides to look like this to provide balance to the rest. My next trip to the job site saw nice progress. The framing and cladding had been completed, the trim boards had been added, and the metal roof was getting installed. I have had a metal roof on every single on of my playhouses – I think it makes these little buildings appear much more significant as a finished product. This isn’t just some asphalt shingled shed you can pick up at you local MegaMart. The folks who provided the metal work on this playhouse were terrific and all the work reflected the same level of care that I am fortunate to receive on most of my full-sized to-scale houses. In te picture above, they are installing the drip edge that will go around the entire roof prior to the installation of the metal standing seam panels. I used an integrally colored siding for this year’s playhouse so the plan was to get everything built and painted prior to installing the siding. That included the dutch entry door along with the casing and trim detailing at the top. This is the detailing at the top of the door. Just like a real house, there is flashing in place. Speaking of flashing, how do you like the G90 caps we made for the tops and ends of the rafter tails? Pretty slick, right? Next trip to the job site, all the standing seam G90 metal roofing panels were installed, and all the exterior trim boards and rafters had been painted. Progress is moving quickly and it’s time to start installing the exterior siding. Just another look at my proof-of-life opening on the side. To the right, you can see the progress on the siding installation. So here it is – I used James Hardie HardieShingle® Siding, the straight edge panel, in “Boothbay Blue” … and it looks amazing. It went up very quickly and the finished product looked exactly how I imagined when I created my initial design concept sketch (the very first image in this post). A look at the “boring” back side. Looks pretty sharp and helps create the seaside cottage look I was going for. There are other sorts of details that help create that look – some you might not ever notice, but are extremely important. Did you notice that the deck was left unfinished but that the underskirt was painted white to match the trim boards for the rest of the playhouse? How about the 1/2″ exposed G90 flashing that runs along the white painted rafter where the wall and the roof meet? It creates a dark stripe to help distinguish the change between the white trim boards on the vertical elevation and the white painted underside of the roof. I brought the Boothbay Blue shingles into the interior of the playhouse – but just on the end walls. Everything else, including the ceiling, was painted white. Here’s a look at the Dutch door from the interior. While I love the door, I don’t love the scale of the doorknob ON the door. It’s really the only clue you have that the rest of this playhouse is built at a scale appropriate for children. Without the efforts of Jose Gonzalez (left) and Juan Montelongo (right), the Cottage House would not have realized its potential. All of the people who worked on this year’s playhouse are the consummate pro, and their work reflects their attention to detail and the pride they have in their craft. I know Juan worked on last year’s ‘Theater Playhouse‘ and I was excited to see him back for this year’s playhouse. And then the nerve-wracking bits begin. I don’t ever really like watching these guys load the playhouse up for delivery. While I know that the playhouses aren’t really that large, and as a result, don’t weigh a whole lot, I can’t help but think (every year) that this is when something bad is going to happen. They don’t call things “accidents” on accident. It’s surreal seeing ‘The Cottage House’ on that skytrak … somehow it makes it even cuter. And there she is … sitting proudly on display until July 31, 2016. If you are in Dallas, you can stop by Northpark Mall and buy a raffle ticket to for The Cottage Playhouse (or any other playhouse should you be so inclined). If you aren’t going to be in Dallas but would like to show your support for Dallas CASA and the fine work they do, you can purchase a raffle ticket online and cast your vote remotely by clicking here. I should clarify that you can buy a raffle ticket and donate the playhouse back to Dallas CASA should you win. Dallas CASA is more than happy to take you up on your generosity should you want to show your support but don’t live in Dallas, or don’t live in a place where you could actually put one of these playhouses. I truly believe that architects have a skill set that is perfectly suited for these sorts of events. I design houses for a living and work with amazing contractors – I can take part of my time and expertise, and contribute in an effort to improve the lives of needy children. Between my personal entry, and the 5 playhouses that were built as part of the ‘Life of an Architect Playhouse Design Competition’, I’d like to recognize the architectural community, and those of you who read this blog, that are making a difference through your support (yes, reading this blog counts as support).